Most Atlanta restaurants close their kitchens around 10 p.m. nightly, which isn’t conducive to the hours kept by night owls or those just getting off work. There’s always the old reliables like Waffle House, but, thankfully, there are plenty of other solid food options available around town for post-10 p.m. dining. Here are the Atlanta restaurants and bars serving late night eats well into the wee hours of the morning. Don’t see a favorite late night food spot listed? Give it a shout out in the comments or via the tipline. Head up Buford Highway just outside the perimeter to Doraville for tableside cauldrons of grilled meats such as charbroiled pork, short ribs, or slabs of chunky pork bacon served with a side of kimchi, dumplings, or Korean pancakes to help soak up the juices and the booze. Open until 12 a.m. Tuesday and Wednesday and until 6 a.m. Thursday - Monday. Many Atlantans swear by this Buford Highway staple as the best bet for tacos in town. The fact that El Rey is open late every night of the week is an added bonus. Open 11 a.m. to 2 a.m., Sunday - Thursday; 11 a.m. to 4:30 a.m., Friday and Saturday. Who couldn’t use a comforting bowl of hot pho and a pot of tea at 1 a.m.? Pho 24 has got Atlanta’s back and it’s open 24 hours a day, seven days a week. Late night food doesn’t have to mean greasy burgers. It can also mean a healthy dose of breakfast and strong coffee. Try an R. Thomas breakfast quesadilla in a sundried tomato tortilla filled with eggs, cream cheese, basil, cheddar, bacon, peppers, and onions or the breakfast stew with red potato corn chowder, quinoa, veggies, dulse, and nori. This iconic Atlanta restaurant on Peachtree Street is open 24 hours a day, seven days a week. This Westside darling guarantees two things: strong drinks and tasty Asian street snacks like pork dumplings, bite-sized meat skewers, or a daily selection of tempura. Open 6 p.m. to 12 a.m., Monday - Thursday and until 2 a.m. Friday and Saturday. The Highlander in the heart of Midtown has been open for 26 years and claims to be “a fixture of Atlanta’s late-night party scene.” Head here for classic bar food (order the tater tots), cheap beer, generously poured shots, and no pretense. Open 11:00 a.m. to 2:30 a.m., Monday - Saturday; 12:30 p.m. to 12 a.m., Sunday. Veterans of the Atlanta late night scene are familiar with this perennial Virginia-Highland favorite and its jalapeño cheese stuffed pretzels, wings, and the devil burger. Be sure to pair those evening eats with Jameson shorties or a PBR. Kitchen open until 1 a.m.
There’s nothing better than sitting on a patio at 1 a.m. after a concert or football game with friends gorging on pub fries, chicken wings, and barbecue egg rolls. Try the Sublime burger—half-pound burger with cheddar, caramelized onion, and applewood bacon, served between two Sublime glazed doughnuts. Open until 2:45 a.m. The Twin Peaks-inspired bar is a regular stop for Atlanta’s hospitality industry employees and locals looking to whet their whistles with a beer and a shot, tikiphiles and taco fanatics on Tuesdays, and cocktail-seekers craving a little cheeky innovation in their glass. Open Sunday and Monday, 5 p.m. to 12 a.m.; Tuesday - Saturday, 5 p.m. to 3 a.m.
With two locations in Decatur and Inman Park, there’s no excuse not to head out for a midnight snack. Order up a Castro or a han cholo with chorizo and a basket of Victory’s daily popcorn. Wash it all down with a Jack and Coke slushie — or three. Open until 2 a.m. except on Sundays. A bar housed in a converted shipping container that not only serves some of the best cocktails in town but also happens to serve a revolving menu of late night bites. The bar’s L8Arm menu begins at 10 p.m. Follow the purple-pink glow from Ponce de Leon. Open late nights Monday - Thursday until 1 a.m. and Friday and Saturday until 2 a.m.
Soaking up Atlanta’s booze since 1929. Some nights simply call for comfort food at 3 a.m. The Majestic on Ponce De Leon serves up strong coffee with diner classics like steak and eggs, biscuits and gravy, grilled cheese and fries, and the Ponce dog piled high with chili, cheese, and onions. Open 24 hours. This Poncey-Highland dive bar is a popular post-shift spot for many of Atlanta’s bartenders, so it must be doing something right. There’s also an outpost in Brookhaven on Johnson Ferry Road. Open 11:30 a.m. to 3 a.m., Monday - Saturday; 12 p.m. to 12 a.m., Sunday. The Midtown Vietnamese meets Cajun seafood spot is open for late night cocktails and bites. Expect smoked shrimp jambalaya, roast beef po’boys, and loaded charbroiled red potatoes to be on the menu along with the popular Bon Ton Hurricane and frozen cocktails the Pimm’s Cup and Vietnamese Irish Coffee at the bar. Open Tuesday - Saturday until 2 a.m. and Sunday until 12 a.m. This Little Five Points spot next to the Variety Playhouse might not be the most authentic Mexican fare, but tacos at a late night dive bar paired with budget-friendly beer totally hits the spot. Open 12 p.m. to 1 a.m., Monday - Saturday; 12 p.m. to 12 a.m., Sunday. 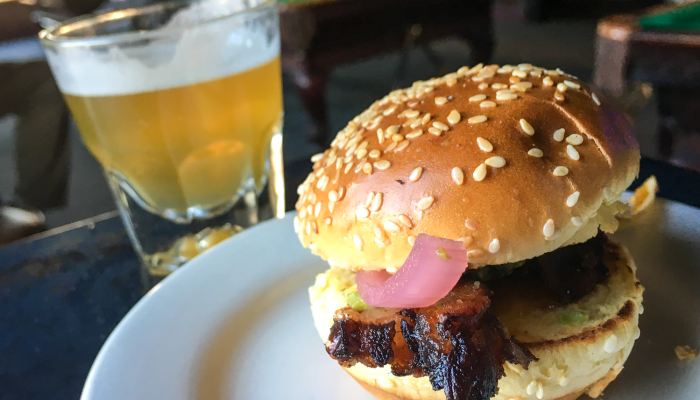 This late-night neighborhood bar in Inman Park serves up traditional pub far with a southern twist including wings, fried pickles, several burgers, and a fried pork chop sandwich. There’s plenty of beer and whiskey to wash it all down. Open 11 a.m. to 3 a.m., Monday - Saturday; 11 a.m. to 12 a.m, Sunday. Noni’s along Edgewood Avenue has always been a late night hang out for dancing and drinks, but now the menu also includes their generously portioned pastas. Look for after hours specials like half-priced bowls of bolognese paired with choice of pasta. Kitchen is open late Thursday - Saturday from 10 p.m. to 2 a.m.
For more than 11 years, Elliott Street Deli & Pub in Castleberry Hill has been a tried-and-true neighborhood gathering spot with some of the city’s best sandwiches and cold beers. Open until 12 a.m. on Monday, Wednesday, Thursday, and Sunday and until 2 a.m. on Tuesday, Friday, and Saturday. Octopus Bar brings snacking in the wee hours to a whole new level. Opening its doors after many restaurants have said nighty-night, the chef-driven menu includes selections like braised and fried rabbit leg, salt and pepper shrimp, and steamed, whole snapper with kimchi. Sip on a Hemingway collins while waiting on the late evening meal. Open until 2:30 a.m.
Sports bar fare typically leaves much to be desired, but Midway actually does a solid job. Order the pimento cheese fritters served with jalapeño bacon jam. Open until 2:30 a.m. Monday - Saturday and until 12 a.m. on Sunday. When the owners of the original Corner Tavern left the mothership to build a new Hapeville location across from the East Point MARTA station, regulars were worried. However, the beer selection and the food at Chairs in the old tavern building is still solid. Order the white chicken chili if it’s on the menu or just grabs wings from the outdoor smoker. The menu switches over to late night eats from 11 p.m. to 1 a.m.